I’m a fairly recent addition to the Solution Design and Innovation team in the Skills Funding Agency. I came in to the SFA as a University drop-out and after a two year apprenticeship, popped out the other side as a Junior Developer. As I detailed in my previous blog post, I feel that the apprenticeship route was right for me, and was a positive experience. At the moment, my job entails a mixture of SDK (software development kit) and web application development. My apprenticeship didn’t precisely prepare me for this exact role, but it helped by teaching me the “way of thinking” for software development and gave me knowledge of the activities involved in software development, such as agile ways of working, planning, and testing. Currently, the most interesting and enlightening part of my job is acting as a mentor for our current apprentices, Jordan and Luke. Trying to teach programming and helping them navigate the organisational aspects of work really helps me to identify my own shortcomings and cement my knowledge. It’s also giving me some insight into what it is like to manage others and the skills required, as it’s the first time I’ve had anyone in the team more junior than myself. 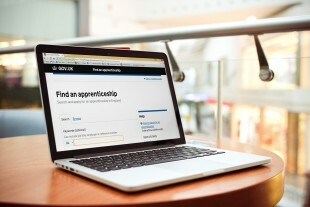 It’s good to see the Skills Funding Agency investing in apprentices – the organisation has a lot to offer. Our apprentices are getting their teeth into proper projects and the SFA has been highly supportive. It really feels as though we're really pushing our apprentices to constantly improve and succeed. I will continue to advocate for apprenticeships, as both a former apprentice and a mentor for apprentices. I’d like to see the SFA become a real centre for success with apprenticeships and continuously improve our ability to deliver high-quality on-the-job training. Apprenticeships produce professional, productive and passionate staff that will, in turn, advocate for high-quality apprenticeship programmes.